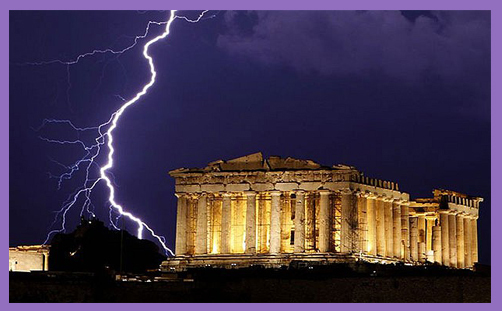 The democratic lightning has struck Athens, but the thunder will reverberate throughout all of Europe. As the ‘anti-austerity’ Syriza party is swept to power in Greece, its leader Alexis Tsipras has vowed to end “five years of humiliation and pain”. Noble nations do not like to be degraded, shamed or sickened. Proud peoples will not abase themselves in mortified dishonour. Not for long, anyway. The euro cannot survive in its present form. Greece is insolvent, broke, bankrupt: its government cannot repay its debts and will never be able to do so. Pumping in a €240bn (£179bn) bailout may have created the illusion of solvency, but it was never anything but political sticking plaster over a malignant economic carcinoma. The love of the euro is the root of all Greek misery. The whole euro-crisis was inevitable precisely because it wasn’t so much built on sand, but on thin air. Greece never actually fufilled the Maastricht convergence criteria in the first place: her accession to the single currency was a mechanism of absolving themselves of risk. The euro exposed the Greeks to debt not only above the value of their assets, but beyond their means ever to repay. The ECB sold this debt on to other EU banks who in turn shifted it on to other EU banks. They were all hedging (and praying) against the risk of default, and pushing those risks even further along. The euro was always a gamble, especially for the Hellenic branch of the European family. Why they ever ditched their ancient drachma – the currency of Plato, Ptolemy and Alexander the Great – is a mystery. Perhaps a nation which carelessly squanders its political sovereignty without regard for its unique heritage as the cradle of Western civilisation – the birthplace of democracy, the fount of Western philosophy and literature, the creator of the Olympic Games, the originator of historiography, political science, mathematical principles, and our dramatic traditions of tragedy and comedy – does not deserve much sympathy for its economic woes. The dream was to be at ‘the heart of Europe’. The euro has driven a stake through that heart and turned the dream into a nightmare. When a nation does not bear the consequences of its actions, its behaviour is distorted. ‘Moral hazard’ is a natural consequence of insulating the profligate from punitive judgement. Greece would have behaved differently if its people had been fully exposed from the outset to the risk, because pain encourages responsibility. When we do not bear the consequences of our actions, we get a false sense of security. Reliance on central banks coming to rescue as lender of last resort is bound to discourage prudent behaviour. When a government guarantees the liabilities of a financial institution, it also risks weakening the currency and causing an increase in interest rates, with all the consequent unemployment, recession, inflation and increased poverty. This has been a constant theme of the Archbishop of Canterbury: Justin Welby understands that this is a profoundly moral issue, for people are reduced to hardship and depression, firms are condemned to closure, more workers to unemployment and more families to homelessness through unprecedented levels of repossession. There are public sector strikes, pay freezes, tax hikes and extensions to the retirement age. The total number of suicides, heart attacks, divorces and mental breakdowns is never actually known. God cares for the poor, the oppressed, and the underdogs in society. He pours His wrath upon those who corrupt justice or create economic machines designed to provide more wealth for the wealthy and deprive the poor. The story of Naboth’s vineyard in 1 Kings 21 suggests that authorities are not free to pursue any policy they please or to ride roughshod over the rights of the poor. The same concerns are expressed time and again by the prophets Amos, Hosea, Isaiah and Micah, writing in the 8th century BC. God demands conscience above political conviction, and a government which places narrow economic considerations above liberty and justice is guilty of worshipping Mammon above God. The single currency was built on sand: it was destined to founder without political union, which will surely now arise. But remove from a nation the right to set its own interest rates to suit its own domestic economy, and in times of turmoil it is left either to tinker with taxation or slash spending. Since the people are not particularly disposed either to high rates of taxation or to cuts in their public services, disquiet turns into protests; protests become marches; marches become riots; riots become social turmoil. And social turmoil slips so easily into civil war. Never forget that the EU’s answer to the EU’s problems is invariably ‘more Europe’: every crisis is seen as an opportunity for more bureaucracy, regulation and centralisation. God’s social design inclines toward the decentralisation and diffusion of power. The natural moral order demands accountability and responsibility, such that nations be allowed to fail and people to bear the consequences of their actions – including the deception, profligacy and irresponsibility of the politicians they vote for and the governments they elect.